According to KentuckyDerby.com, there have been 20 “prep” races for the Kentucky Derby so far this year. That’s 29 events in which points have been awarded to Kentucky Derby hopefuls — points that will ultimately determine who’s in and who’s out of America’s greatest horse race. I say that, in truth, there has been but one Kentucky Derby prep (last weekend’s Florida Derby) run this year — with four more remaining (Blue Grass Stakes, Santa Anita Derby, Wood Memorial and Arkansas Derby) including two this weekend (the SA Derby and Wood). Recent podcast guest Brian Zipse of Horse Racing Nation loves this horse and I can see why. The son of Lemon Drop Kid comes from the clouds and could get the perfect setup with the likes of Noble Moon, Kristo, Schivarelli, Uncle Sigh and Social Inclusion in this field. What’s more, his speed and pace figures are competitive. In his last start (the Private Terms at Laurel), in which he rallied from 18 lengths back at the first call, Kid Cruz earned a 98 Brisnet speed figure (today’s par is a 104) and a -7 late speed ration (LSR). His subpar speed rating in the Remsen can be excused due to the slug-slow pace in that affair, but there is absolutely no excuse for his subsequent impression of a tortoise in both the Holy Bull and an optional claiming event. This guy appears to be moving in the right direction, but he needs a major performance boost to compete with the likes of these. The 91-day layoff doesn’t inspire confidence either… although the last two workouts — both at a mile — are very interesting indeed. I suspect this son of Tapit was entered solely because the connections expect — or are hoping for — a pace meltdown. Personally, I think Harpoon’s subpar LSRs — a -12 in the Gotham and -10 in the Sam F. Davis — make this hope a forlorn one. 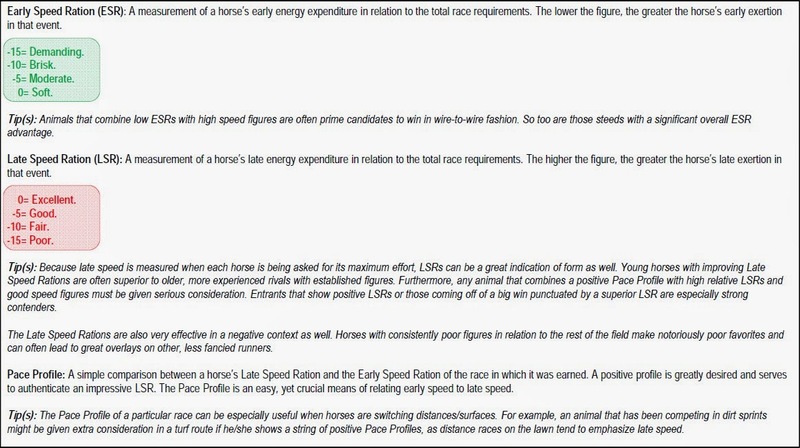 His latest LSR (-2) was great… but it was earned in a race that featured an 84 Brisnet speed figure (BSF). After a decent try in the Grade III Sham, this colt proved unratable in the San Felipe and would up getting beat by 13 ½ lengths. The presence of Martin Garcia in the saddle today makes me think the game plan will be to stick much closer to the pace this time. Son of the speedy Montbrook (6.3 AWD of progeny) is bred to be a sprinter, but he’s very intriguing in this spot. Not only does he look like the quickest of the quick, but his last race (granted, it was a lowly optional claiming affair) wasn’t half-bad. Schivarelli earned a 98 BSF while recording a positive pace profile in a dominant win on Feb. 21. Even a repeat of that effort makes him interesting. Love the way this colt has progressed. His speed figures are solid, if not spectacular (he’s earned a 99 BSF in each of his last three races), and his overall LSRs are second only to Effinex (who is much slower). Forget the state-bred nonsense — those races were last year; this year, the son of Noble Causeway has been nothing but money. To paraphrase those commercials, trainer David J. Smith doesn’t win often, but when he does… well, he makes ‘em count. I suspect Effinex is too slow to compete against the likes of these, but the colt did improve greatly in his first start under Smith. He’s game as they come, with solid overall speed and pace figures. Price is key. So, here’s the deal: Yes, this colt is talented, but, as I’ve often said, finding a talented horse is not what betting the races is all about — or even partially about. If you’re seeking the most talented contender in a race, just check out the tote board. Social Inclusion is likely to be favored today; on that, most racing fans agree. And that favoritism will be based on one race — a wire-to-wire score in an allowance race featuring an absurdly slow pace (0 early speed ration) over a notoriously speed-favoring track (Gulfstream Park) on March 12. Oh, and did I forget? Social Inclusion broke from post 1 that day. Today, he starts from the 11-hole, faces several other prominent speedsters and meets Grade I competition for the first time in his career. Anybody taking 2-1 on his chances is either crazy or incredibly brave… I’ll make a case for straitjackets. Son of Bluegrass Cat with the low-percentage connections is still a maiden, although his numbers are OK (not good, just OK). Do you want to know the story about how this colt got his name? Yeah, neither do I. I just know it’s awful. That said, this Doug O’Neil trainee put in a decent run last time while vastly improving his previous numbers on dirt. Great last race (95 BSF, -5 LSR) and no knocks to speak of. Just broke his maiden (in start number six) and will need to improve greatly to even get a sniff against this group. His combination of overall speed and quickness looks formidable. Interestingly, although California Chrome’s sire (Lucky Pulpit) gets 80 percent of his wins in races under a mile, his progeny also show great improvement, from a speed figure standpoint, in routes. Art Sherman trainee is a legitimate favorite. Still like this guy as a Kentucky Derby candidate, but the reality is he will need to improve several lengths to visit the winner’s circle today. Can he do it? Of course. Will he do it? That’s what fair odds are for. Looked short in the San Felipe, but exactly how good is the son of Rock Hard Ten? I guess we’ll find out. Derby race is one of the good race and they are going so well. This year they organize so many events and it is good for the people who take interest in this type of the race. I really like this whole stuff and it is good.